When you are a female musician and singer on the Rock and Metal business, it may be difficult to survive. It is the strong hand of time that leaves its mark, and - on a beautiful woman's face and body - it is hard to be ignored. On the other hand, women put aside their career for family so rock n' roll is not a priority. 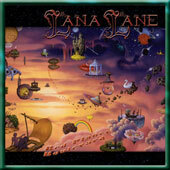 Lana Lane has a deferent story, with more than 10 years on the symphonic Rock scene. Married to the famous producer/keyboardist Erik Norlander, Lane continues to rock and amaze with releases like Lady McBeth, a concept album based on Shakespeare's famous play, and the latest Gemini, a collection of covers from PINK FLOYD, HEART, CREAM and others. The strong songwriting duet of Lane and Norlander strikes again with Red Planet Boulevard. Into The Fire is the opening song, with a heavy riff and melodic vocal line. This is the main music style of the whole album; great guitar riffs and excellent melodies that match to Lana Lane's vocal abilities. The Frozen Sea starts with clean guitar chords and then the verse becomes a little heavier, in an EVANESCENCE style. Capture The Sun has a Power Metal air, while Jessica is a power ballad with distorted guitars and slow steady rhythm that brinks to my mind Lana Lane's debut album Love Is An Illusion. Stepford, USA has a catchy chorus melody that reminds me of Ozzy's No More Tears (a little bit). Shine has a FLEETWOOD MAC guitar intro but then the distorted guitar kicks in and the major scale melody gives a happy tone on the song. Lazy Summer Day has a '60s guitar melodic intro, like the famous instrumental Sleepwalk from THE VENTURES, but on the chorus the song takes the 2007 sound. But, the best song of Red Planet Boulevard in my opinion is Save The World, with a mid-tempo rhythm great guitar intro and a chorus melody that sticks to your head. Angels And Magicians has another heavy and melodic riff and the clean guitar takes over on the verse with Lana singing comfortably. The Sheltering Sorrow is the next ballad of the album and the Red Planet Boulevard closes with the instrumental self-titled song that has a fade in drum intro and another melodic guitar theme. This song has the main melodies from all the other songs, like a best of melodies of the album gathered all together in one song. For Red Planet Boulevard Erik Norlader made the production and played keyboards & bass as well, while Peer Verschuren (NETH, VENGEANCE) made the excellent guitar job and Ernst Van Ee (TRENODY) set the rhythm carpet with his drums. Lana Lane gives her voice and talent in a Hard Rock album with heavy sound and great melodic lines that may be simple, but music sometimes is like football; if you play it simple you can achieve your goal. Red Planet Boulevard is already in stores in Japan and Europe (and on January 29th, 2008 in USA). Go out and get it!